The coin is sealed in a tamper-proof transparent film providing additional protection and visibility for your coin. The back of each card includes assay information as well as the signature of the RCM's Chief Assayer, assuring that you are holding a real asset that will protect your wealth. The Canadian Gold Maple Leaf Coin is one of the purest regular-issue gold coins in the world. It is the official gold coin of Canada and is minted with gold sourced exclusively from Canadian mines. Since its introduction by the Royal Canadian Mint in 1979 this annual series has featured a similar design, although some special issues include colour, privy marks or other flourishes. The globally-familiar Canadian maple leaf emblem is showcased on the reverse of this gold bullion coin and the obverse features the most recent official portrait of Queen Elizabeth II. 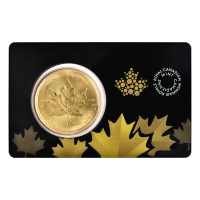 As an added security feature, the Gold Maple Leaf also adds the industry leading security features of light-diffracting radial lines and a laser mint mark with the year of production in it. The Royal Canadian Mint is the world's largest gold refiner, and the gold maple leaf is recognized world-wide as a liquid, high demand investment. A 1 oz Gold Maple Leaf coin is a timeless gift, a smart investment and a mark of true national pride.